From, Addisnegeronline.com: The Embassy says that public uprisings, originating in Tunisia and Egypt, are expanding throughout the region to countries such as Bahrain, Jordan, Libya, Yemen and lately to neighboring Djibouti. According to embassy sources, the US government has expressed concern that similar uprisings may begin in Ethiopia, and that symptoms of such uprisings are already being revealed. The US Embassy in Addis is preparing for talks with opposition party leaders on issues of current international affairs. According to sources, the program released is still liable to changes. The Embassy says that public uprisings, originating in Tunisia and Egypt, are expanding throughout the region to countries such as Bahrain, Jordan, Libya, Yemen and lately to neighboring Djibouti. According to embassy sources, the US government has expressed concern that similar uprisings may begin in Ethiopia, and that symptoms of such uprisings are already being revealed. 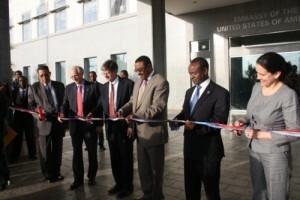 The Embassy says that the meeting is scheduled to take place on Sunday, February 20th 2011. Sources also say that leaders of the main opposition parties are invited to the meeting. Leaders of all the parties under the umbrella party, Forum, as well as the AEUP and the EDP are among those invited. Sources interviewed by Addis Neger about the meeting say that the Embassy may have discussed the issue with the government. They also say that the meeting with the opposition party leaders may be a preliminary meeting to inform the leaders of their concerns regarding potential negative effects of riots. The meeting may be a primary discussion to facilitate further talks between the government and the opposition leaders prior to possible uprisings, the same source told Addis Neger. The meeting may call on the government to take positive steps toward a shared agreement with the opposition parties for a wider political space prior to potential public uprisings and unnecessary consequences of riots.